From July 26th 2013, SIA will take over one of two daily Surabaya flights currently operated by regional subsidiary SilkAir.Singapore Airlines will significantly boost its Indonesia services from July, with the introduction of daily flights to Surabaya, and an increase in frequency to the capital Jakarta and the resort island of Bali. Surabaya is the second-largest city in Indonesia and the capital of East Java. The airline will operate 285-seat Airbus A330s for the daily Surabaya flights, increasing combined SIA and SilkAir capacity on the route by 48 per cent. Also on July 26th, SIA will introduce a ninth daily service to Jakarta, and will simultaneously add its fourth daily service to Denpasar (Bali). SIA currently operates 56 weekly Jakarta flights - more than to any other destination in its network - and 21 weekly Denpasar flights. SilkAir currently operates 60 weekly fights to nine Indonesian destinations, and in July and August will launch services to two more points, namely Semarang and Makassar. �The Indonesian economy is growing and this has increased demand for both business and leisure travel,� said Lee Wen Fen, SIA acting senior vice president marketing planning. �Indonesia is an especially important market for the SIA Group, as demonstrated by SIA�s new services to Surabaya, our additional flights to Bali and Jakarta, and SilkAir�s new services to Semarang and Makassar. Singapore Airlines' (SIA) inflight entertainment system, KrisWorld, now features a wider selection of Chinese and Indian movies, as well as new music channels. Movie titles for August include mandarin hits like "Honesty" starring Hong Kong heartthrob Richie Ren, Hindi blockbuster "Khushi" with rising stars Kareena Kapoor and Fardeen Khan in the lead roles, and Tamil movie "Yee Nee Romba Azaga Irukey ". In addition, music lovers can also enjoy an exciting array of contemporary sounds and evergreens with an enhanced audio selection. SIA, in a first-ever exclusive tie-up with United Kingdom's Ministry of Sound, introduces a new dance music channel called Adrenalin, hosted by renowned disc jockeys like Jakatta and Sandy Rivera, and showcasing cutting-edge dance club beats. Besides Adrenalin, customers can also choose from three other channels: Chill-Out (ambient music), Swing (akin to Swing & Big Band music that was popular in the US in the 1950s to 60s), and Latin Grooves. These channels, including Adrenalin, are part of the "Audio Broadcast" selections in KrisWorld. Those who like contemporary pop music can also tune into two new "on-demand" audio selections: Chart Toppers featuring the latest albums ranked in the top music popularity charts worldwide and Solid Gold with music from the 1950s to 1980s. The expanded KrisWorld selection is available on all SIA aircraft featuring the Wisemen 3000 system, a new-generation inflight entertainment system with audio-visual on demand capabilities. With "on-demand" audio, TV, and movie channels, the customer is able to pause, fast-forward or rewind a CD or movie anytime. KrisWorld now offers over 190 entertainment options, including video and audio programming, games and news. Passengers can choose from a selection of 30 movies, more than 50 TV programmes, over 50 music CD albums, and more than 30 Nintendo® games. Based at Singapore Changi Airport, Singapore Airlines is the national carrier of Singapore. 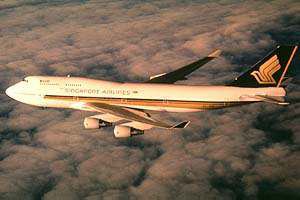 Using a fleet of wide-body Boeing and Airbus aircraft, including the A380 of which Singapore Airlines was the launch customer, Singapore Airlines operates an extensive network across Asia, North America, Australasia, Europe, Africa and the Middle East. Singapore Airlines joined the Star Alliance on 01-Apr-2000. Capa Aviation.